An excellent guide with detailed descriptions and loads of pictures. 68pp. The French town of Calais was under English rule from 1347 until 7 January 1558. But, the production of Calais farthings did not commence until the reign of Henry V and ended during the reign of Henry VI. In 1363 the town was made a staple port and it had become a parliamentary borough sending 2 Members of Parliament to the House of Commons in England by 1372. It cost almost a 1/5th of all the revenue collected in England to maintain the town as an English possession. 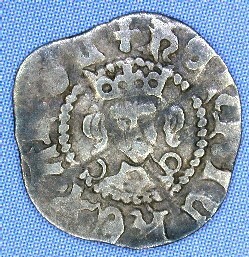 But, with peace came prosperity, and it is precisely during these years, which cover the 'Annulet,' the 'Rosette-Mascle' and part of the 'Pinecone-Mascle' coinages of Henry VI, that the Calais mint enjoyed its period of greatest prosperity and, in fact, issued the majority of the coins then in circulation in England. 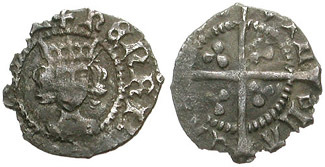 There are two "tell-tale" signs to distinguish Henry V farthings from those of his predecessor, Henry IV. First - the coins of Henry IV have a lock of hair to the left of the king's face standing away from the head. This is not the case with coins of Henry V.
Second - the formation of the inner circles on the obverse. 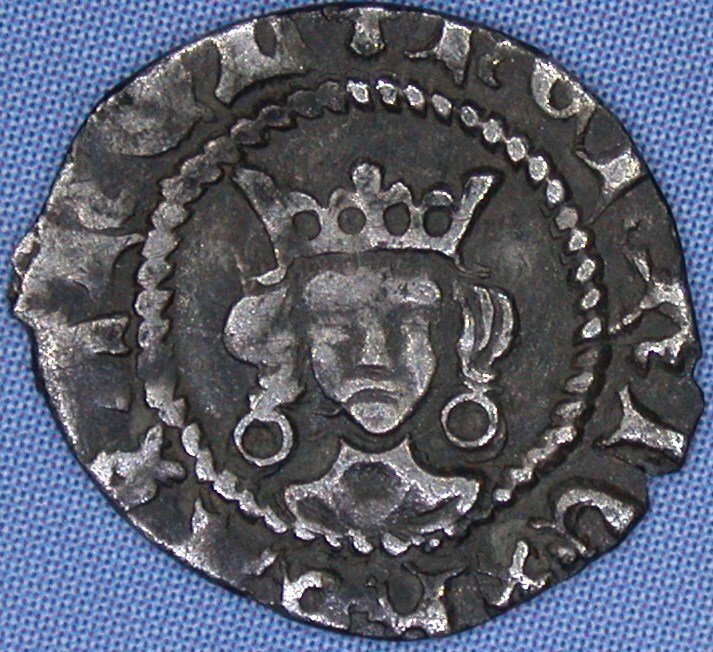 Coins of Henry IV are formed of many small dots which often appear fused together. 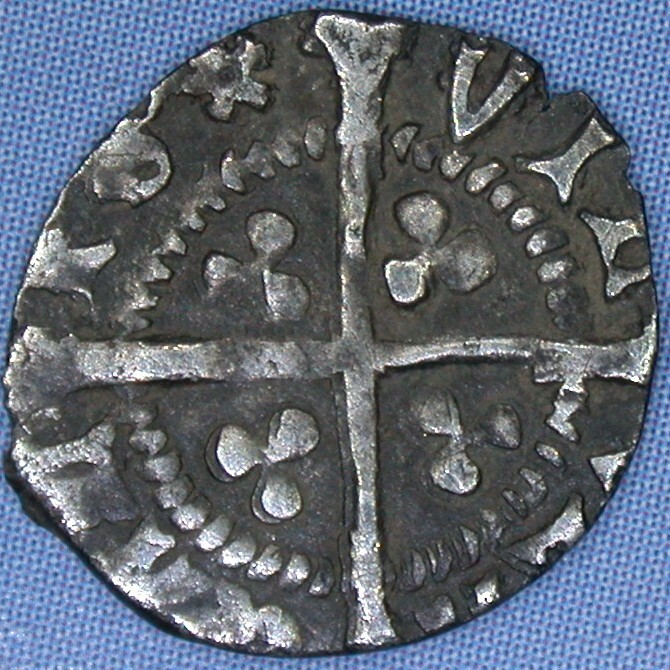 On coins of Henry V there are fewer dots and these appear as short strokes at an angle to the radial direction (see the photo for clarification). allowing for the dating of farthings. Full flan coins are difficult to find. This makes collecting farthings from this period an interesting and challenging task. 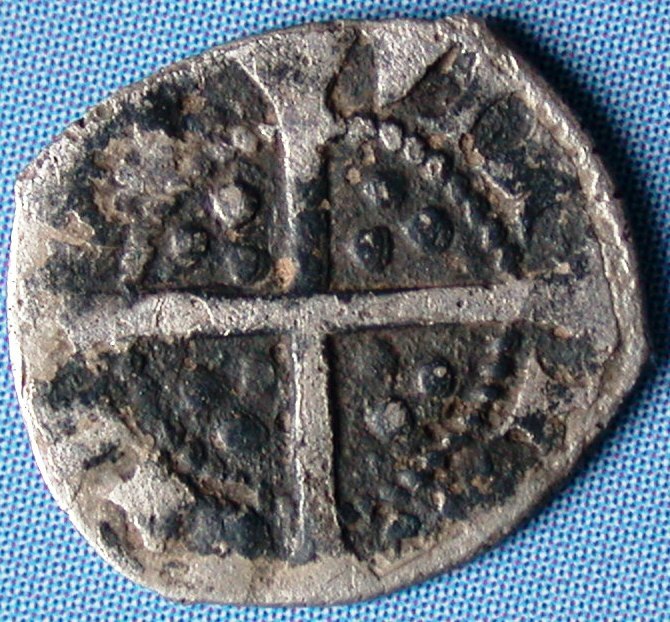 On 16 May 1422 there were isssued 'to William Lackford, Richard Buckland's man, all irons, etc necessary to coin money in Calais (including) one for silver farthings2' and the issuing of new coins commenced on 20 July 14223. The minting of the Annulet issue ended in April 14274. Annulets at neck. Thin neck. Mintmark is a "cross pommee." that these are extremely rare coins. Annulets at neck. "Bib" chest. Mintmark is a "cross pommee." are a number of discernibly different issues over the reign. obverse die was paired with a new Rosette-Mascle reverse die. Richard Buckland, the Treasurer of Calais and the Warden of the Calais mint, had the unusual burden of having to pay for the dies used to make coins at the Calais mint. 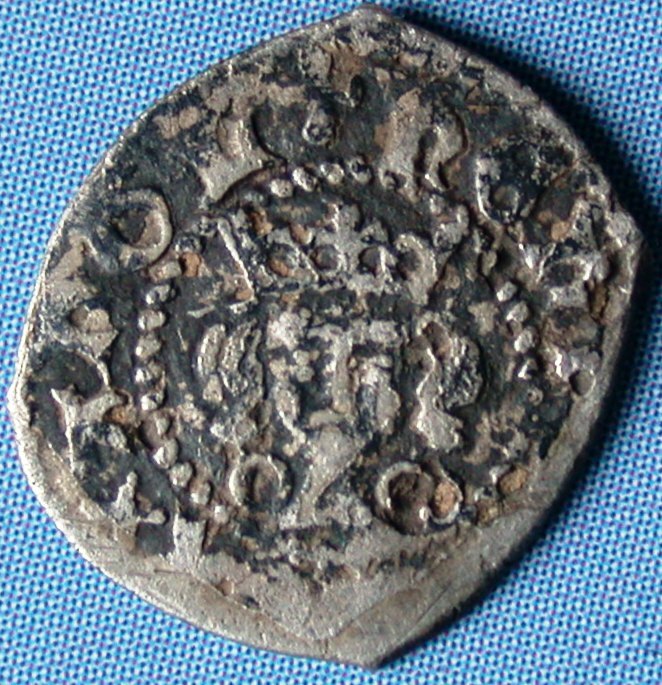 As a result of this arrangement, records exist of the number of dies supplied to Calais between 29 May 1427 and 27 February 1430 through 16 seperate indentures and covering the entire period when Pinecone-Mascle issue farthings were produced. 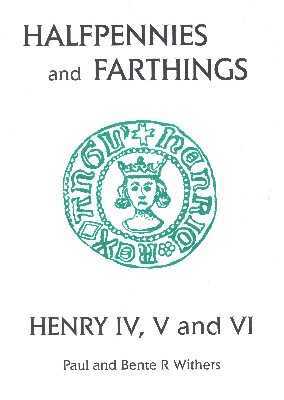 Farthing dies were supplied in two of these indentures: on 30 November 1427 for 3 pyles (dies for the 'heads' of a coin) obverse and 9 cruses (dies for the 'tails' of a coin); and on 14 January 1430 for 8 pyles and 18 cruses. Based on these records there were a total of 11 pyles and 27 cruses used in Calais during the entire Pinecone-Mascle issue of farthings at Calais.6. Rosette and Mascle in legend. Mintmark is a "cross pommee." 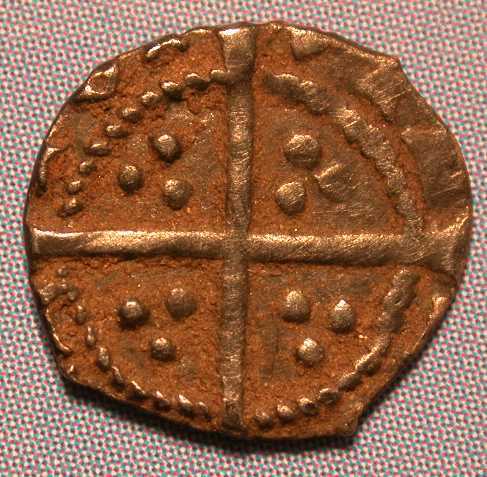 There is no record of farthing dies being issued between 1430-31.6. Pinecone and Mascle in legend. Mintmark is a "cross pommee." On 13 December 1435, Richard Buckland the Mint Master for Calais, was authorised to be supplied with a large number of dies necessary to coin money including 60 dies for the minting of halfpennies and farthings, for which he paid 4d for each farthing die 7. These dies were not put into immediate use due to the ongoing war with the Duke of Burgundy and the Foreign Roll records state that no coins of any denomination were struck between 30 March 1435 and 10 February 1436 at Calais8. In 1437 Robert Whittingham, as Master of the Calais mint, reveived 3 pyles (dies for the 'heads' of a coin) and 12 cruses (dies for the 'tails' of a coin) for farthings9. 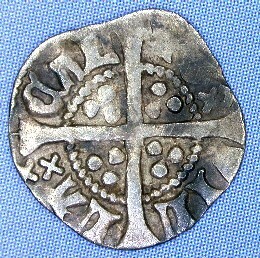 On 29 January 1441 Buckland's successor, Robert Whittingham, was authorized to receive 3 obverse and 12 reverse dies for farthing production at the Calais mint10. 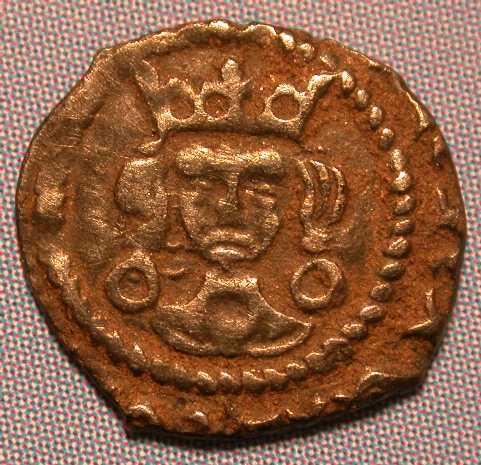 Even though farthing dies were issued in 1435 and in 1441, there are currently no known Leaf-Trefoil farthings from the Calais mint. 2 Proceedings and Ordinances of the Privy Council, ii, 332.
to help collectors in their classification (London, Seaby). pp 87. 8 Numismatic Chronicle, 1911, p. 173.